These Arts and Crafts mitts were inspired by Peacock & Vine: On William Morris and Mariano Fortuny, A. S. Byatt’s beautifully illustrated volume about two famous textile artists. Flower and vine beaded motifs on the hands borrow from William Morris’s intricate designs for fabrics, tapestries, and wallpaper; the pleated lacy cuffs recall Fortuny’s famous pleated dresses. Finished Size 6.75” hand circumference and 10” tall. Yarn Juniper Moon Farm Findley (50% merino wool, 50% silk): #01 fresco, 1 skein. Yarn distributed by Knitting Fever. Needles Size 00 (1.75 mm): set of double-pointed. Adjust needle size if necessary to obtain the correct gauge. Notions Markers; stitch holder; size 0 (2 mm) crochet hook; size 11/0 Miyuki delica glass seed beads (.25 oz 7.2 g/tube) (see Notes): #DB011-TB metallic olive (green), #DB282-TB lined amber vermilion (red), #DB119 transparent honey luster (yellow), #DB464-TB galvanized dark purple, #DB177-TB transparent aquamarine AB (blue), and #DB1201-TB marigold (orange), 1 tube each; #10 beading needle; short length of sewing thread for beading needle; tapestry needle. Gauge 43 sts and 59 rnds = 4” in St st.
Notes If working at a looser gauge, consider using size 10/0 beads so they won’t slide around the stitches. 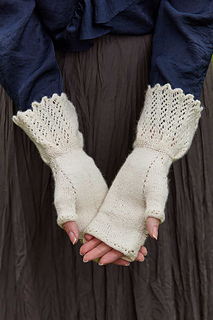 The cuffs of these mitts are worked from side to side, then the two ends are grafted together. Stitches are picked up along the top edge and the hand is worked in the round from the cuff up.